NOTES: Shop for the best price as some retailers over-price the kit. The International Harvester Company, was a United States agricultural machinery, construction equipment, vehicle, commercial truck, and household and commercial products manufacturer, with roots in the 1830s . International Harvester sold off its agricultural division in 1985 and renamed itself Navistar International Corporation in 1986. With the truck and engine divisions remaining following the 1985 sale of the agricultural division, International Harvester Company changed their corporate name to Navistar International in 1986. Today Navistar International's subsidiary, International Truck and Engine Corporation, manufactures and markets trucks and engines under the International brand name. The Lonestar, a class 8 heavy truck, was introduced in 2008. The retro look of the grill/hood makes it unique in the heavy truck field. Some say it looks like a Chrysler PT Cruiser on steroids, but if you compare it to a 1938 International Harvester Pickup, you will see the real family resemblance. This 1/25th scale kit is huge! There are over 300 parts and none of them are individual track links! With the addition or deletion of the sleeper roof extension (1 part), you can build two versions. The sprues are all wrapped in plastic, very detailed and are very well molded without visible injector pin marks or flash. The engineering of parts and parts placement on the sprues really shows a modeler was involved with the design on this one. Most of the sprue attachment points are hidden or very small. Even the chrome is well thought out so that you don’t have major seams or attachment point cuts showing. The exceptions are the fuel tanks and air cleaners. They have a long seam where the halves join. The upside is that the seam on the fuel tanks is hidden when you add the aero skirts. The tires are soft vinyl and appear very realistic. The parts also include a thin metal, flexible metal mesh grill insert. This is a very nice touch. The decals are bright and in register. They will be used to add woodgrain to the interior, a nice dashboard, various exterior markings and a trucking company name. Your choice for company names are Erb, a real Canadian company, and Moebius Transport. To begin the assembly I broke it down into several steps, engine, chassis, interior and cab/sleeper. Everything was washed in dish soap, and given a good rinse. Don’t skip the wash! There is a lot of mold release agent on this kit and it will mess up your paint and leave visible finger prints on the chrome. The engine is a modern International Maxxforce 15 with EGR. International discontinued this engine and replaced it with a Cummins, rather than certify it for newer emission standards. 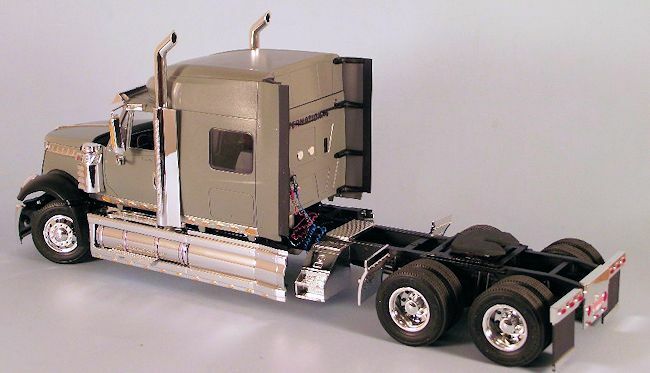 I would have like to see a Cummins engine in the kit, but I understand the licensing problems. 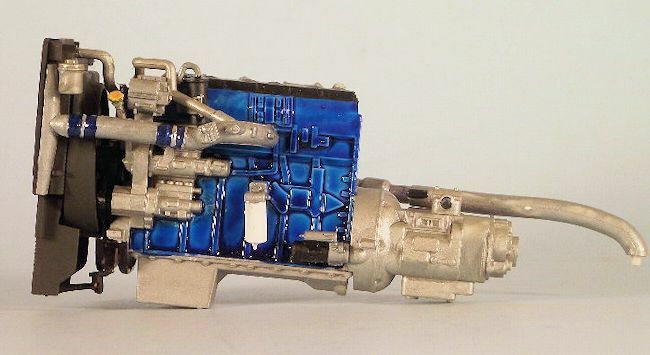 The engine was sprayed an appropriate blue and assembled per instructions. The Moebius instructions are confusing, but with a lot of test fitting everything is an excellent fit. I went back with brush paint and did the detail painting. Chrome foil was used to make the hose clamps. The finished assembly was given a black wash and set aside to dry. The chassis was next. Before you start; figure out a way to insure you assemble the frame rails and cross pieces so that everything is square! I use a small carpenter’s square taped to the glass on top of my work bench. I check the fit often and when the basic assembly of frame and cross pieces is complete, I stop and work on something else until the glue is dry. Next, I added the rear suspension and differentials. There are no surprises here, everything has an almost snap kit tightness to fitting the parts. I followed the instructions and part numbers very closely, for a change. There are parts that must go in a front/back or left/right position for everything to line up. I assembled the front springs and axle per the instructions, but I didn’t glue one side of the axle to the spring. When you insert the engine you will be very happy you did this, it saves a lot of fitting, bad language and possible broken parts. No chrome parts were added to the chassis and it was set aside to dry and wait for painting. This interior is exceptional! Everything was prayed with Krylon grey primer before assembly. The dashboard was detailed with paint. I thought it looked pretty good, then in the spirit of doing a build review, I added the decals. They feel a little thick, but I applied them over a drop of Microset then brushed a little Microsol on top. The decals settled down very well on the uneven dash board. It looks so much better than my hand detailing. A little scraping on the join areas and the whole thing was glued together. Again the assembly was almost a snap fit. The dashboard was masked off and a final coat of grey primer was sprayed on. Some small details were picked out with a brush and the rest of the wood grained interior decals were added directly to the primer coat. I trimmed them very close and used Microset. They didn’t silver and settled down nicely. The cab/sleeper is huge and intimidating and very well molded. The cab roof is a separate part that has the glue joins along the same seams as seams on the real truck. I glued the roof on and sprayed the cab, hood and fenders in black Krylon primer. The fenders were sprayed gloss black and after drying the headlights were installed. Beautiful fit. The intimidating part is all of the lights on the lower cab. After spraying the cab Krylon grey, chrome foil was applied to the lower cab/sleeper before installing the lights. Each depression for each light was given a prep drop of turn signal amber paint. When that was dry, I inserted a clear lense into each depression. Each lense was given a coat of turn signal amber to glue it into place. Extra lenses are included, but I didn’t loose any. My installation technique was to wet the tip of my finger, touch the outside of the lense and just press it into place. The final assembly was easy. 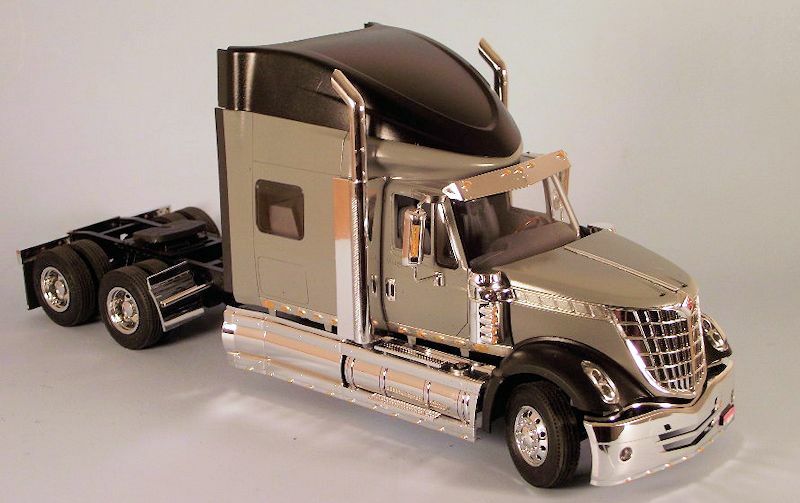 All of the chrome and bright parts were glued to the chassis and cab. The engine was fitted to the frame and the front axle was glued to the spring. I used epoxy to glue the floor of the interior to the chassis. This is a heavy model and someone will pick it up by the sleeper. I can see the chassis dropping off at the worst possible moment. Hence the epoxy. 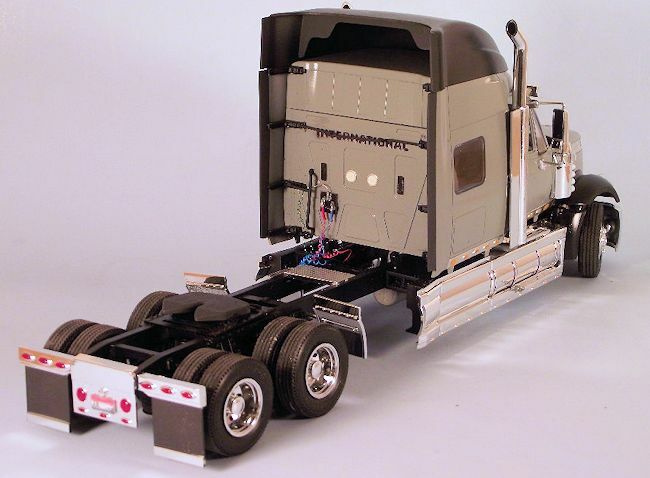 The assembly for the interior and cab is unique. The instructions have you glue the floor to the chassis, then slip the cab in place over the interior. It worked, but if I hadn’t used epoxy on the floor/chassis mounts, I know I would have broken the floor loose from the chassis. On my next build, I will glue the interior into the cab first, then mount the whole thing on the chassis. The hood was fitted. It fits close, but not quite what I would like. After looking at the Moebius test builds on line and talking to one of the builders, I saw they had the same problem on multiple builds. So I decided if all of those very good builders couldn’t get it straight, it was close enough for me. I sprayed all of the major parts with Krylon primer and paint. I used Model Master brush paints for all of the detailing. There were no reactions between the two. I didn’t use the decals for the outside of the truck, as I am having my own decals made for a series of these trucks, in my own company name. I can tell you the decals on the inside worked well and reacted very well to Microsol and Microset. If I may nag a bit; don’t forget to wash all of the parts, prior to priming/painting. This was a long (3 month), but enjoyable build of a modern truck! Moebius is honest and rates this kit as a skill level 3. Bottom line this is not a kit for a beginner because of the instructions, but it is a very detailed and easy build of a new subject for the average to experienced builder (if you use Revell instructions). 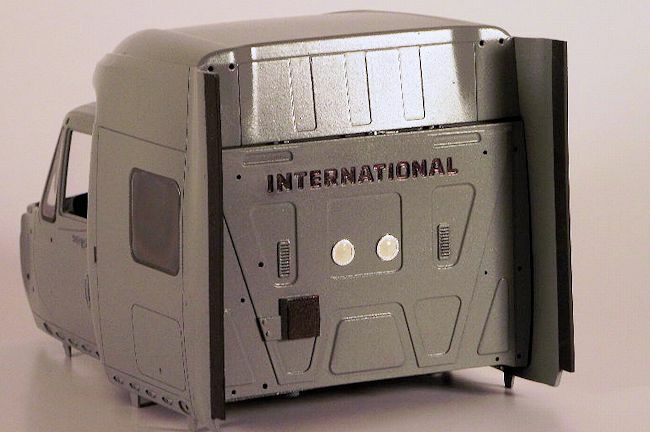 I have now bought six of these kits because the kit itself will build into two different sleeper versions and I am doing a daycab, a wrecker and of course I need a spare for who knows what. So, yes, I highly endorse this as a well done kit!